We are excited about our new projects for 2019 and we hope that you will be too! This year, we are partnering with Crossroads International, War Child Canada and the Stephen Lewis Foundation to give children life skills and a chance to overcome the barriers blocking their access to a quality education. We believe that girls everywhere have the right to a quality education, safety, dignity and the ability to make their own choices about their bodies and when and whom they marry. We hope that these projects will help. A quality education can provide a protective barrier for girls. We know that the more schooling a girl has, the less likely she is to marry early or have a child before she turns 18. In fact, research shows that universal secondary education would virtually eliminate child marriage. All four projects are unique in scope, but they all have the the same ultimate objective: to address the needs of some of the world’s most vulnerable children in low-income countries where educational opportunities are sparse and where girls are impacted by sexual and gender-based violence (SGBV), child marriage and a high drop-out rate from school. They all incorporate our Mobile Learning Lab (MLL). The MLL uses offline technologies to give children access to quality learning materials and to bridge the gap for children in remote areas who often lack Internet connectivity, electricity, text books and even trained teachers. We are excited to see how this fun, interactive learning tool can address the diverse needs of children in different circumstances. We designed the MLL to lower some of the barriers to a quality education. In our pilot project in Sierra Leone, we set up the MLL after school so that children could interact with the materials that most interested them. They had the freedom to experiment – to explore a new topic or practice a skill they had learned in class – without an adult telling them what to do. The children loved it, and math and literacy scores improved: a double success! You can read about the results HERE. Because this offline technology is so new, both Crossroads and War Child will incorporate it into existing programming as a pilot project so that they (and we) can further assess what works best. Our research in Sierra Leone convincingly showed that self-directed after-school learning can have a positive impact on educational outcomes. But we always welcome new ideas to position the MLL for real impact for the greatest number of children. All of our partners address girls’ education from a holistic perspective, recognizing that for real learning to occur, we must confront the underlying issues that impact girls’ lives, like SGBV and early marriage. As always, community support is the lynchpin to success. So our partners engage in community-building activities to make sure that everyone is on board. We are pleased to partner for the first time with Crossroad International, a charity focused on ending gender disparity and violence against girls and women. 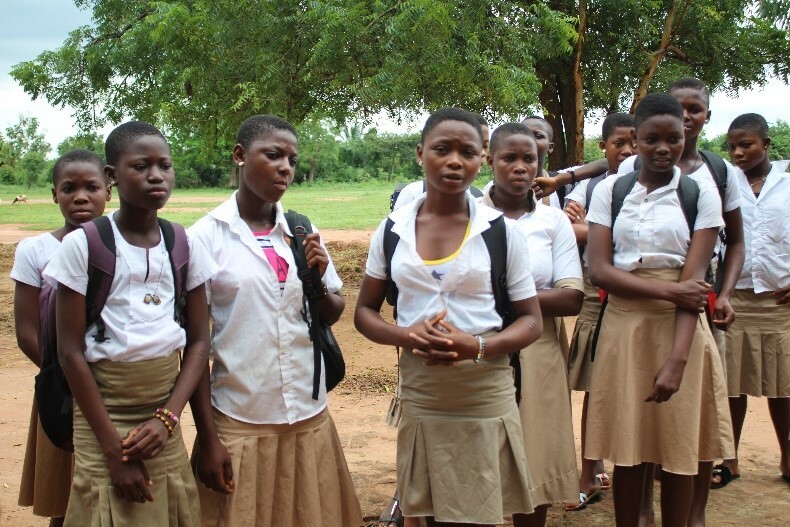 Our project with Crossroads takes on the needs of poor, rural children in Togo with school-based clubs. The project will give girls the tools they need to understand their human rights. Facilitators will discuss child marriage, SGBV and sexual and reproductive health so that girls can make informed choices in their lives. Crossroads will source the best culturally sensitive information – along with up-to-date academic content – and upload it to the MLLs deployed in five girls’ clubs and one boys’ club. Children will have access to these learning tools and the choice to explore whatever interests them. The idea is that this will enable them to get information on, say, reproductive health, more privately. At the same time, academic learning tools, like Khan Academy, African storybooks along with curriculum-specific information, will give them a chance to improve their literacy and math skills. Both life skills and progress in academic topics are crucial if children are to stay in school. Our project with War Child Canada focuses on children impacted by years of conflict in South Sudan’s Malakal region where just 36% of girls are enrolled in primary school compared to 64% of boys. War Child will incorporate the MLL into existing school programming to boost educational content, including stories and science activities with female role models. And, to reach girls who are not in school – due to early marriage and child birth, or family decisions that prioritize brothers over sisters when resources are limited – War Child and its local partner will offer accelerated learning programs so the girls can boost their literacy and math skills. Our long-standing partnership with the Stephen Lewis Foundation has encouraged us to take a slightly different approach. We have funded many education projects through this Canadian foundation to support children impacted by HIV/AIDS and, this year, we decided to split our $100,000 grant into two smaller projects: one in Zambia and another in Zimbabwe. These projects both incorporate the MLL into learning centres where children can get information on SGBV and reproductive health, along with academic content and books, in a self-directed way. In the Zimbabwe project, for the first time, 60 million girls will fund a project in an urban centre – Harare – to empower impoverished girls to continue their education. Our projects this year will reach children in different circumstances who are all missing out on getting a quality education. It’s every child’s right to be able to go to school and to learn in safety. We hope that these initiatives will help vulnerable girls get skills they need to make informed life choices and to progress in school. Visit our website to read about our projects in detail, along with information on our selection process.